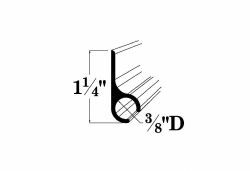 Dimensions for a 3/8 in. Awning rail to accept a 3/8" awning rod. Available in a satin anodized finish in 12 ft. and 6 ft. lengths. See above Docs link for other 3/8" Material Sections in a Table View.